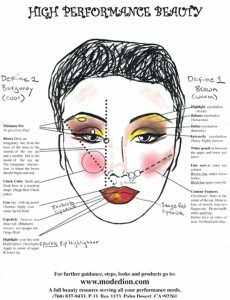 When Christine Dion visits a Dance Studio or Theater to teach her Stage Beauty Workshop she always leaves a Mode Dion Face Chart Poster with the steps and colors to use as a guide for makeup rehearsals. This Face Chart can be printed out and shared to help as a application reminder. Contouring And Highlighting Features with 5 Color Concealer Pallet. Previous story Contouring And Highlighting Features with 5 Color Concealer Pallet.